September 16th - November 2nd. “In the nights of annihilation of the last war, the frame of mankind was shaken by a feeling that resembled the bliss of the epileptic. And the revolts that followed it were the first attempt of mankind to bring the new body under its control. The power of the proletariat is the measure of its convalescence. If it is not gripped to the very marrow by the discipline of this power, no pacifist polemics will save it. Living substance conquers the frenzy of destruction only in the ecstasy of procreation”. – Walter Benjamin, excerpt from “to the Planetarium” from “One-Way Street”. “Art does not reproduce the visible, rather, it makes the visible” – Max Ernst, excerpt from “The Creative Credo”. 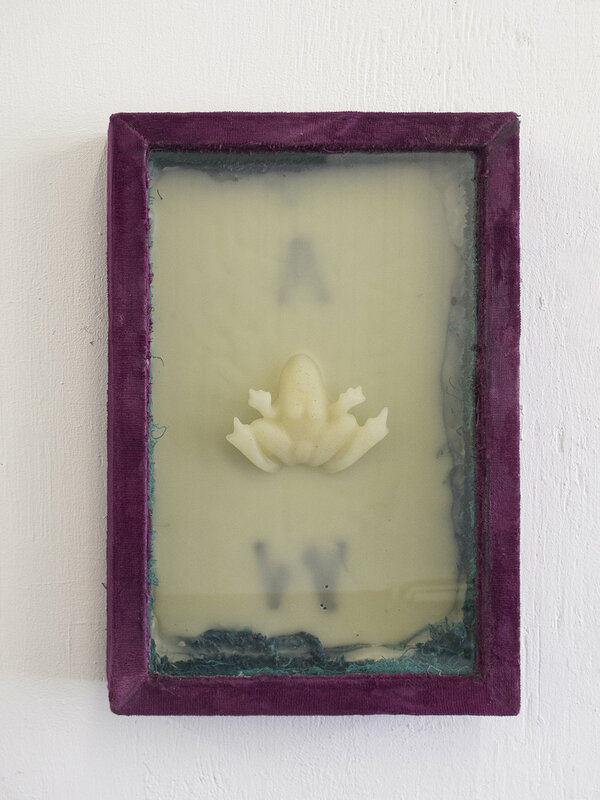 “Pedro Wirz continues his second solo exhibition, titled “breastfed tadpole”, at Kai Matsumiya. Consider the world enveloped with office carpet where it serves as the chief nutritive source like soil. In such a world, nature, culture, and technology integrate not as separate entities but as a cohesive ecosystem. Office carpet serves as the soil for twigs. Frog like critters with mammalian components reveal themselves as neither living or dead. Letters represent nothing else but the end of language. Inorganic materials are expected to birth something unwitnessed. Technology itself finally bleeds alongside nature as if both are intertwined as one. 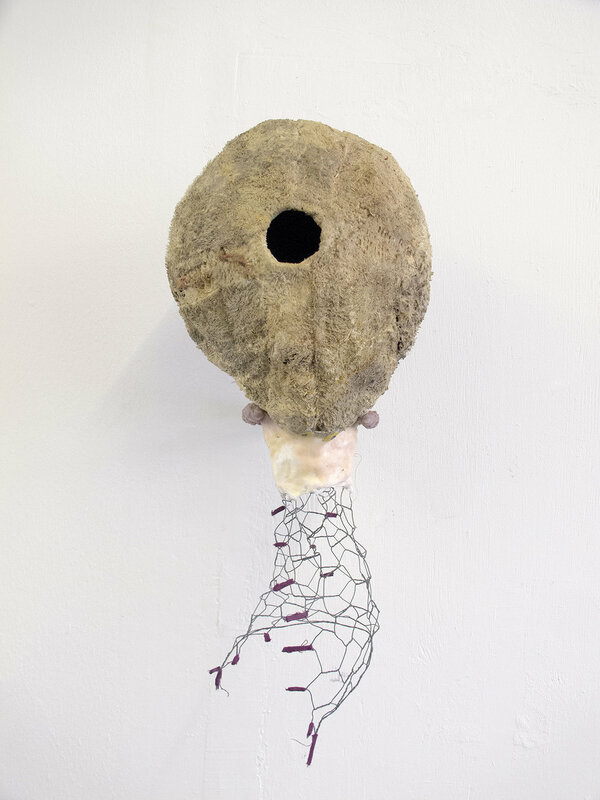 Animalistic and insect-like architectures resembling nests, cocoons, and eggs fuse with human cultural practices. Raw new cosmic life abounds. 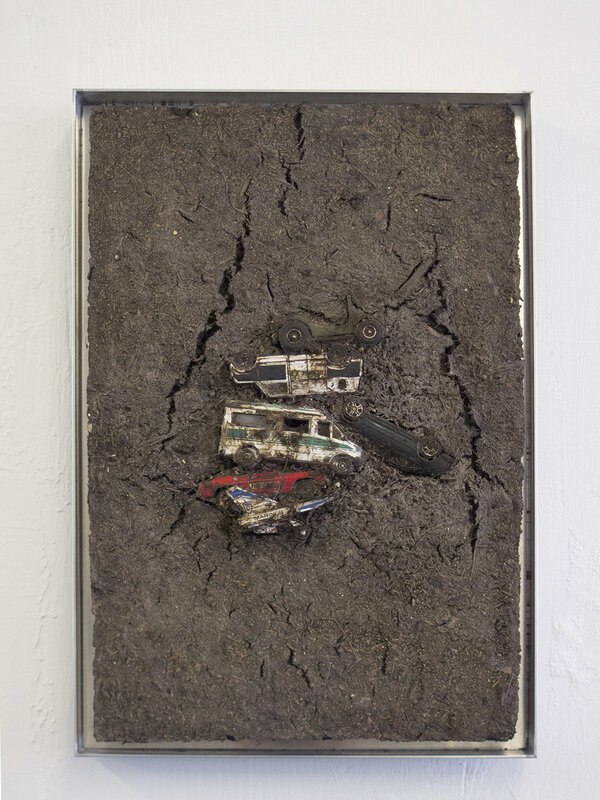 Substances from the amazon forests, Swiss parks, junk yards, soil, latex manufacturing, and discarded toys and ornaments comprise the materials of Wirz’s art works. A large degree of the artist’s research for his practice is also informed by his upbringing in the Paraiba Valley, Brazil. The region's layered, primordial, modern and contemporary landscape has been the site of massive demographic shifts as European royalty, slaves, indigenous people, merchantmen, and industrialists collide within its varied multifarious histories. As a result, the region has produced art, architecture, and culture that appear as if all had been undergoing the process of beginning, mixing, and resetting. Part of Wirz’s impetus, then, originates from the adopted spirit and perspective of a child reconfiguring, completing, and beginning anew lost objects, dying landscapes, and incomplete mythologies of post-apocalyptic and dystopian environs. Recent solo and two person exhibitions include Jan Kiefer, Pedro Wirz, 2018 (Galerie Nagel Draxler, Cologne); Fábula, Frisson, Melancolia (Instituto Tomie Ohtake, São Paulo, 2017); Dobrar de Espinho, Anzol (Murias Centeno Gallery, Porto, 2017); and The Horse Who Drank Beer (Kai Matsumiya Gallery, New York, 2016). His work has also been presented at the Tinguely Museum (2016), CCS Bard Hessel Museum of Art (2015), Künstlerhaus Stuttgart (2013), Dortmunder Kunstverein (2013), Palais de Tokyo (2013), and Kunsthalle Basel (2011). In 2016, he was the artist in residence at the Swiss Institute Rome, and he has recently completed a residency at the Akademie der Künste in Berlin. Wirz has been awarded the ProHelvetia Cahier d’Artistes Prize 2018 and will have his first monographic book presented in Basel next June, during Art Basel. His work is currently on view at the Kunst Raum Riehen in Basel, and Kunsthaus Pasquart, both in Switzerland. Other upcoming projects include solo exhibitions in January at LongTang, Zürich, February at Centre Culturel Suisse in Paris, May at Kunsthaus Langenthal and his debut solo show at Galerie Nagel Draxler. Born in 1981 in Pindamonhangaba, Brazil, Wirz currently lives and works in Zürich, Switzerland.